CP STAR (Career point scholastic test for Analysis and Reward) is going to issue the Career Point Star Scholarship 2019 for all eligible and interested students to participate and showcase their explicit knowledge. It is one of the national level tests for the students from class 8th to 12th. The main objective of this scholarship test is to analyze the IQ of the students who are strong-minded and is preparing themselves to attain success in life. 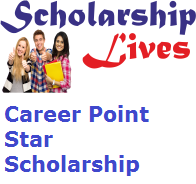 Career Point Star Scholarship is prearranged by Career point which is an organization that holds a great standing for providing excellent education and prepares the student for the specialized world.. CP- STAR is an aptitude test started since 2010. Through this scholarship test to filter the brilliant and young youth, talented students provided many opportunities to the deserving candidates. Student from ICSE/ CBSE/ Govt or state board. Applicants must be from science background having PCM/B as the subjects. Cash award up to 50 thousand to each class topper. Books worth INR 24,000 direct from Kota will be given to the toppers of each test. Detail presentation report will be given after the result of the examination. The Competitions Examination will be Pen and Paper based. The qualified students of round one will sit for round two. The qualified students of CP-STAR round second will be called for the final round of interview at the center. Round 1 test Result will be course date wise and the student will be knowledgeable via SMS and also will be displayed on the official website. The consequence for Round 2 and 3 will be affirmed at National level for each class.